The New Orleans Pelicans parted ways with general manager Dell Demps on Friday morning (Feb. 15), according to an ESPN report. ESPN said the Pelicans are considering director of player personnel David Booth and special advisor Danny Ferry for the interim role. Kawhi Leonard is embracing his time in Toronto, but the NBA All-Star will show off his latest signature shoe in Charlotte this weekend. Leonard has hooked up with New Balance to create a brand new basketball shoe, the OMN1S. If NBA legend Kareem Abdul-Jabbar were the commissioner of the league, the landscape would be very different. The collusion grievances filed by Colin Kaepernick and Eric Reid against the NFL have been resolved. Attorney Mark Geragos and the NFL released a joint statement announcing the development on Friday afternoon. Due to a confidentiality agreement, there’s no word on the terms of a settlement that comes after several months of discussions between the league and counsel for the two players. The NFL has two years remaining before the current collective bargaining agreement is up, and it appears the league could be headed for a sticking point. The Steelers don’t have to let Le’Veon Bell walk without getting anything for him. Antonio Brown may have given a sign on Friday that he is open to smoothing things over with the Pittsburgh Steelers, but his social media activity still says otherwise. There can only be four. Them’s the rules when it comes to faces of United States presidents carved into Mount Rushmore. Likewise, it was our rule for choosing the four faces that would best represent each of Major League Baseball’s 30 franchises. Players Only: With respect to the dozens upon dozens of influential owners, executives, scouts and broadcasters who have left their mark, there are no baseball legends quite like baseball players. Franchise, Not City: A player need not have played in an organization’s current home in order to be counted among said organization’s all-time greats. Statistics Matter: This should probably go without saying, but the more a player produced for a given team, the better. So Does Legacy: We also considered players’ championships, accolades and other achievements. Good guys were also welcome, though not at the expense of important historical significance. And Era: Special commendations for post-integration (1947) for post-expansion (starting in 1961) players, and virtually no commendations to the stars of the 1800s. One Player, One Team: A single player can’t be on more than one team’s Mount Rushmore. The Red Sox are all Xander Bogaerts knows. And it’s not just his near six years of Major League service time. It is Feb. 15, which means we’re 105 days into the baseball free agency period. Superstar sluggers Bryce Harper and Manny Machado remain free agents. As teams report for spring training, the hot stove remains relatively cold but in the meantime, we’ll be here to round up all the notable rumors and news around baseball. As always, our free-agent tracker is a great way to catch up on what’s already happened on that front. With the Detroit Red Wings on the verge of missing the postseason for the third straight season, it’s time to devote our attention to June’s 2019 NHL draft, and more specifically the draft lottery. Welcome to the NHL Trade Buzz. There are 10 days remaining until the 2019 NHL Trade Deadline on Feb. 25 at 3 p.m. ET, and the buzz is picking up. Will Micheal Ferland be moved as a potential rental or will Carolina Hurricanes keep the forward to help their push to make the Stanley Cup Playoffs? With defenseman Andrej Sekera close to returning from a conditioning assignment, what will the Edmonton Oilers do to make room for him? John Hoven: Toronto Maple Leafs GM Kyle Dubas was at the Ducks-Canucks game on Wednesday. Michael Augello: Elliotte Friedman said on Sportsnet that Dubas could have been looking at Ducks defenseman Brandon Montour who has another year left on his deal at $3.38 million. He’ll be an RFA who has arbitration rights. 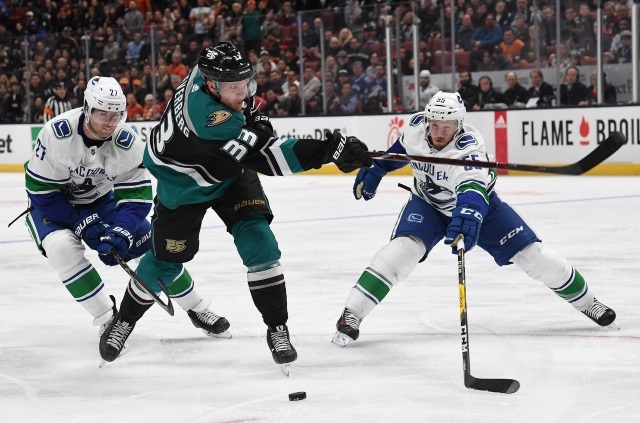 Jonathan Davis: Sense from talking to sources at the Ducks-Canucks game, the Ducks may not want to go more than four years for on a Jakob Silfverberg extension. Silfverberg is looking for at least a five-year deal. Jonathan Davis: A five-year deal would take Silfverberg till he’s 34-years old. It would also be in the $6 million per year range. Wouldn’t be a surprise if Ducks traded him at the deadline, but that could change if they are able to move out some extra salary cap space. Chris Nichols of Nichols on Hockey: Darren Dreger was on TSN 1260 talking about Edmonton Oilers Jesse Puljujarvi playing a limited role in the NHL while the Oilers farm team is on a roll. Management needs to trust their coaching staff to find out what they have long-term with Puljujarvi. They still don’t know what they have him. If the coaching staff comes back and says he may not be more than a third liner, then it may be time to move him. “There is a trade market for Jesse Puljujarvi, but my understanding is that the Oilers just want too much – the ask on him is way too high. I don’t even know what that is. I can take a guess at it when you start talking about either a top prospect or a first-round pick obviously plus something given where he was drafted. “But I don’t get the sense that Puljujarvi has much, if any, interest in going to Bakersfield and playing in the American Hockey League. Doesn’t have a choice organizationally, so if the Oilers want to take a tough stand on him then so be it. Auston Matthews knows about contract hell, and his negotiation with the Toronto Maple Leafs wasn’t it. “I went through a contract thing when I was going to Switzerland that was a debacle. Much more stressful than this,” he said.